Welcome to Bloomers! We’re a northern Minnesota garden center and landscaping company who cultivates hand-selected plants and designs imaginative landscapes. 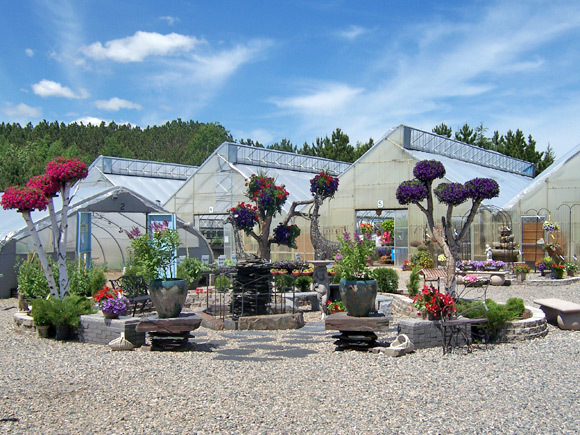 Located in Grand Rapids, Minnesota, our heart and hands are dedicated to giving you the best customer care, widest plant selection, and the finest materials to make your project or space naturally beautiful. Whether you plan to: landscape your yard; cultivate annual, perennial or vegetable gardens; purchase beautiful hanging flower baskets; or are looking for the perfect garden gift, accent, or accessory – Bloomers is the place! From the moment you arrive you’ll experience extraordinary customer care and behold innovative, artistic floral design and landscaping that are the hallmarks of Bloomers. We’re out to exceed your expectations and eagerly await an opportunity to serve you. Take a few moments to browse our site – we hope you’ll discover ideas and inspirations to transform your outdoor spaces. Then contact us to: estimate your landscaping project; pre-order custom designed baskets or planters; purchase your garden accessories; or simply tap into our vast landscaping and gardening expertise. You see at Bloomers, we make beautiful easy.